The 1-3-1 zone defense is a unique defense that is run by teams at many different levels. It’s been successfully run by many youth teams all the way up to college basketball where Coach Beilein uses it as his base defense for Michigan. In this article, we’re going to be discussing both the half-court 1-3-1 zone defense and the three-quarter court 1-3-1 zone defense since both are often implemented simultaneously. This defense works best if you have long, athletic players; but with a couple of simple adjustments, can easily work of teams with a variety of athletes. At its core, the 1-3-1 zone defense is an aggressive defense that relies on cutting off passing lanes, anticipation, and deflections to create turnovers and fast break opportunities for your team. If you decide to implement the 1-3-1 zone defense for your team, it’s imperative that you’re ready to play fast basketball! 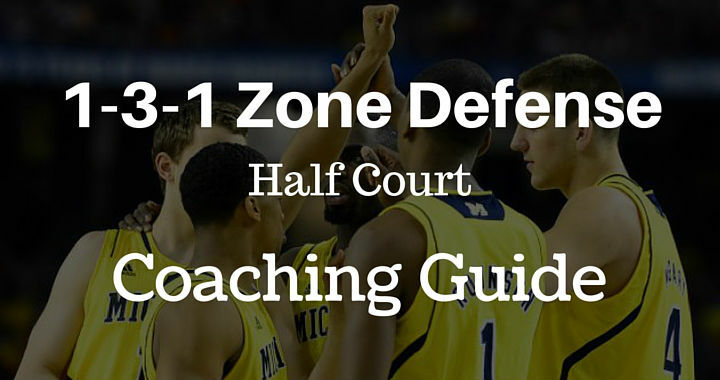 The 1-3-1 zone defense has a very different concept to most defenses. While in most defenses you always have a player defending directly between the opponent with the basketball and the basket, the 1-3-1 instead cuts off normal passing lanes and forces the offensive team to throw lob passes over the defense, pass slow bounce passes around the defense or attack off the dribble. This gives the defensive team plenty opportunities to read the pass and get deflections or steals. 1. The offense has to adjust to your defense – When running the 1-3-1, it’s so unique and different to most defenses that opposition teams can’t run their regular offense. They are forced to adjust and play much differently than they’re used to. 2. Speeds up the game – Great for teams with athletes that want to play a fast style of basketball. 3. Causes mass confusion – Because of the uniqueness of the defense, players will be confused as to how they should play against it and where it’s best to attack the zone. 4. Great for transition offense – When your team does get steals they’re in the perfect positions to run the floor and get an easy score. Both wings sprint the sidelines and the chaser will usually be the person in front. 5. Easy to prepare for the opposition – There are only a couple of ways to attack the 1-3-1 zone defense. Most teams will go to a 2-1-2 offense. Your team will know what to expect and how to defend the limited variations. 6. Changes tempo of the game – This is a fantastic defense to implement mid-game when you want to change the tempo or need a couple of quick steals. The offense won’t know what hit them. 7. Many variations and adjustments – As you’ll see further on in the article, the 1-3-1 has plenty of variations and adjustments that will allow you to easily adjust to different teams and counteract their strengths. 8. It’s fun and exciting – I’ve found that players love to run this defense and getting them to buy-in to it is easy. Players love that they’re encouraged to anticipate and go for steals and deflections, it creates great transition offense, and it’s unique! 1. There are a few areas that can be exploited – The 1-3-1 zone defense is weak in a couple of areas. Specifically, the corners and high post. 2. Your team will give up easy baskets – When you’re running an aggressive defense like the 1-3-1 and players are diving for deflections all game, you must be okay with giving up easy baskets from time to time. Players will occasionally be caught out of position. 3. Size does matter – Although it’s possible to have success using this defense with a small team, it definitely makes it easier if you have tall, long athletes. 4. Takes time to learn – If you’re not using the 1-3-1 as your main defense then you have to question whether it’s worth the limited practice time to spend teaching it to your team. 5. Rebounding – As with any zone, rebounding is an issue since players aren’t on direct opponents to box out. Players must attack the boards and find someone to put a body on. 6. Requires a lot of energy – If your team doesn’t go deep on the bench then your players will quickly get fatigued and struggle to run out the game. If you’re going to use the 1-3-1 zone defense, you must be willing to use your bench. 1. No direct passes – Your defense must not allow any straight-line passes. They must stay in the passing lanes and force the opposition to make high lob passes and slow bounce passes. 2. Move on air-time of the pass – Players must rotate to the next position as the ball is being passed through the air. This requires them to be in stance and anticipating where the next pass will be made to. If your team is too slow, the opposition will get many open shots. 3. Everyone must crash the boards – Since zones are susceptible to offensive rebounds, every player must crash the boards hard when a shot is made and get the rebound. 4. Must stay in defensive stance – If players aren’t in defensive stance they’ll be too late to react when passes are made. Being late will lead to open shots and breakdowns in the defense. The coach must be constantly reminding the players to get their hands up! 5. Read the passer’s eyes – Defenders must always be reading the passer’s eyes and anticipating where the next pass will be made to. 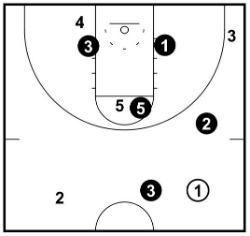 The 1-3-1 is an aggressive gambling zone and players should be going for deflections when they get a chance. The first thing we must talk about is the difference between the three-quarter court 1-3-1 zone defense and the half-court 1-3-1 zone defense. The main difference between the two is that in the three-quarter court zone the defense traps in all four corners of the half court. We call the three-quarter court 1-3-1 zone ’23’. In the half-court zone, the defense traps only in the baseline corners of the half-court. We call the half-court 1-3-1 zone ’13’. The three-quarter court defense is more aggressive while the half-court zone is more conservative. 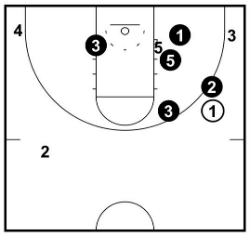 As the name suggest, the 1-3-1 zone defense is set up in a 1-3-1 formation. There are four positions on defense which we’ll now walk through. The defender at the top of our zone is called the ‘chaser’. There are three defenders across the middle of the zone. The two on the outsides are called ‘wings’ and the player in the middle is called the ‘center’. If you decide to push the dribbler to a specific side each time, then your smaller wing should be on the side you’re influencing the dribbler to and your bigger wing should be on the weak-side for better rebounding. At the bottom of the zone, we have the defender we refer to as the ‘warrior’. The 1-3-1 zone defense doesn’t have specific spots where certain positions must play. Instead, you must know your athlete’s abilities and put them in zone positions that will best suit their strengths on the court. Before we start, here’s something you should keep in mind. This is the order in which I believe you should choose the players to fill each role on defense. 1. Pick the chaser first. 2. Pick the center second. 3. Pick the warrior third. 4. Pick the wings last. In my opinion, the chaser is the most important position in the zone. 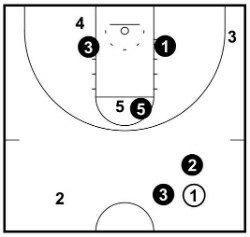 The player filling this position should be athletic, have great anticipation, and have a big motor since they’ll be covering a lot of the court. The main role of the chaser is to influence the dribbler to one side of the court and then not allow the basketball to be reversed back to the other side of the court by playing up high in the passing lane of the guard-to-guard pass. Their feet should always be facing the sideline. They should be relentless when going for deflections with their feet or hands whenever a pass is attempted. When the ball is passed to the corner the chaser is responsible for guarding the ball-side elbow. The chaser is also required to be a weak-side rebounder whenever shots are taken from the wing or the corner on either side of the court. The wings are on the outside of the zone and are responsible for trapping in both corners, defending the ball when it’s passed to the wing on their side, and guarding the weak-side low block when the ball is on the weak-side. An easy way to tell if the wings are in the correct position is that they should always be opposite of each other. If the right wing is up, the left wing should be down. If the left wing is up, the right wing should be down. If the zone is set up correctly, when the ball is on the opposite side of the court, the wing defender on the low block will be the only weak-side defender. From here they must anticipate and attempt to deflect or steal any skip passes that they can get their hands on. When the ball is far out from the three-point line the wing player will defend the passing lane to the corner while the chaser defends the reverse pass. If the wing defender catches the ball close to the three-point line the wing defender defends them on the hip closest to the baseline gradually pushes them out while not allowing them to survey the floor. The wings are crucial when it comes to rebounding since most shots will bounce long. Along with the chaser, they’re in charge of getting weak-side rebounds. 1. Stay between the basketball and the ring at all times. 2. Keep the ball out of the post. The center position isn’t easy. You must have a big player that’s willing to battle for position at all times because that’s what they’ll be doing. We want the center to front the post at all times. On the high post, on the low post, everywhere. We want them in front to deny the pass to a vulnerable part of our zone, the high post, and also because they must be in position to help if the offensive guard decides to attempt to penetrate. So if the basketball gets swung from the wing to the corner the center must quickly battle for front position on the low block. We don’t worry about the lob over the top because our weak-side wing is on the weak-side low block and should be able to intercept that pass. The player that fills the role of the warrior must be exactly that… a warrior. The warrior will be required to cover both baseline corners which isn’t an easy task (they will be sprinting from side-to-side a lot), and they are required to battle for position inside for a majority of each defensive possession. A lot of teams like to put their quickest, smartest player in this position. More often than not the point guard. But if you have another smart, athletic player with a big motor (like the chaser), this could be an ideal position for them as well. The warrior must be smart and must be willing to take charges. They must always be on the ball-side of the court fronting the low post until the basketball is passed to a corner. 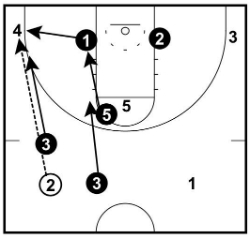 When it is they must close out making sure to not allow the corner player to drive baseline. The team will set up how it was shown under ‘initial setup’ above. 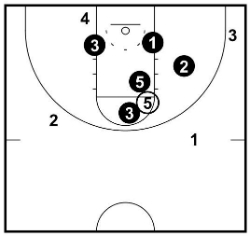 The chaser on the free-throw line, the center, and both wings form a line a couple of feet out from the three-point line, and the warrior begins in the paint. Chaser must not allow the ball to be dribbled up the middle of the court. The ‘pick-up point’ is the point at which the chaser will start pressuring the basketball. For the three-quarter court press, we make this the foul line. From this point, that chaser will start pressuring the basketball to one side of the court. They will do this by angling their body so that the dribbler has no choice but to dribble up the sideline. If they lob the pass over the top to another guard, the chaser must turn and sprint to pressure the other guard in the same way. The ball must never be dribbled down the middle of the court! The chaser should be active and bouncy at all times. They want the dribbler to question whether they can throw a lob over the top without them getting a hand on it. 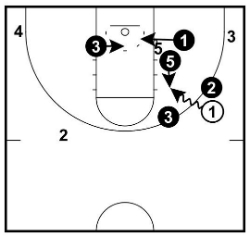 As the dribbler crosses the half-court line, the ball-side wing will step up and set a soft trap a couple of feet from the offensive player. The reason we set a soft trap instead of an aggressive hard trap is that we don’t want the dribbler to split the trap and beat us. A great idea here is to have your players ‘stunt’ at the basketball to try and make the dribbler pick up the basketball. If this does happen, the chaser should shade over towards the opposite guard, taking away the guard-to-guard pass, the ball-side wing must put pressure on the basketball, and the other three players should be in full deny. If performed correctly, this will usually lead to a steal or deflection. Whether the offensive player picks up their dribble or not, all we want to force with the soft trap is to force the dribbler to throw a lob pass over the trap that we might be able to deflect or steal. 1. No sideline – The wing player must close out at an angle that give the dribbler no chance of beating the trap down the sideline. This is the worst possible outcome. If the dribbler does split the trap, we’d prefer they did it between the defenders where they’ll dribble into our center player. 2. Close out with high hands – This means that if the dribbler wants to pass the basketball down the line to the corner or low wing, they’ll have to throw a lob pass that our warrior might be able to pick off. While this is happening the center is establishing front position in the high post. Remember, the center must always be between the basketball and the basket. The warrior is establishing front position on the ball-side block and is ready to sprint out for a deflection if the ball is lobbed to the corner. 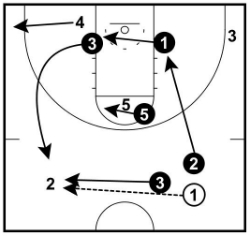 And the weak-side wing player drops back to the weak-side low block. All three off-ball players are reading the eyes and body of the offensive player with the ball and are ready to anticipate and pick off a lob pass or slow bounce pass. Once the basketball has been pushed to a sideline we want to do everything we can to keep it on that side of the floor. This means the chaser must stay in-line with the basketball with 10 toes towards the sideline, playing directly in-between the guard-to-guard pass. They should be active with high hands to make the dribbler question whether their pass will be intercepted. Instead of setting a soft trap (23) there are a number of other ways you can defend in the 1-3-1 as the ball is coming over half-court. If you want to defend more conservatively an option you have is to pull the defenders back closer to the basket and choose not to trap the half-way corners. 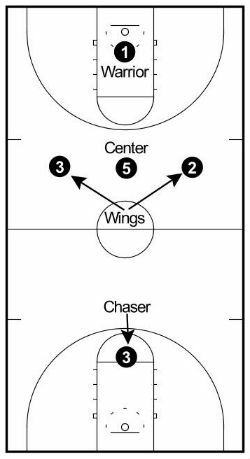 The chaser will still stay in-line with the basketball preventing the reversal pass, but instead of the wing player extending out and setting a soft trap, they stay back in the passing lane of the direct pass to the corner. Everyone else on the court defends the same way. The hard trap is a great alternative to use if your team is down towards the end of the game or if you simply want to change the tempo of the game and play more aggressively. 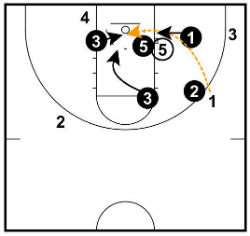 This involves the ball-side wing and the chaser closing in hard for the trap as the ball crosses over half-court. The other players should be up an extra step in the passing lanes and anticipating a steal. Hard trapping might lead to a few more easy baskets for the opposition since the defense gambles more, but it can result in more turnovers which has the potential to change a game. If the opposition does lob a guard-to-guard pass over top of the chaser, the chaser must turn and sprint to get to the player with the basketball. As usual, they close out with high hands and with 10 toes towards the sidelines, staying directly in the passing lane of the guard-to-guard pass. 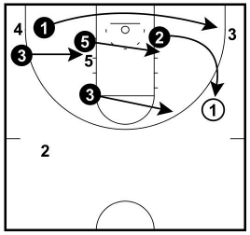 The wing that was on the weak-side must now come up and pressure the basketball the same way the other wing just was. The wing player must close-out to the ball by making a banana cut so that they first cut off the direct pass to the corner before closing out with high hands to the player with the basketball. The reason for this is because the 1-3-1 is vulnerable in the corners. The warrior is responsible for the corners and it’s incredibly hard for them to sprint corner-to-corner on a ball reversal. So we must prevent the pass down the sidelines, or, at the very least, force them to make a lob pass. 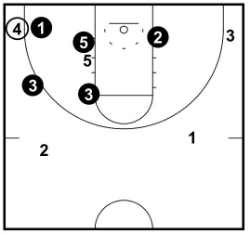 The center has slid across and is fronting the high post so we have help if the offensive player decides to put the ball on the floor. On the reversal, the warrior must again sprint to the opposite side of the floor (yes, they sprint a lot!) and establish front position on the ball-side low block if the pass hasn’t already been made to the corner. And the opposite wing will fall back to the weak-side low block. Remember, if one wing is up, the other wing is down. They’re always opposite each other. If the pass is made to the corner and everyone is in the correct positions, the warrior will step out to the ball from the low block making sure not to give up baseline. The ball-side wing will close out to the corner with high hands and the wing and warrior will set a hard trap in the corner. This trap will be more aggressive than the half-court corner trap. Players setting the baseline trap must make sure not to foul. They must keep arms out and pressure with their lower body. We don’t get steals directly from the players trapping. What we want is for the player with the basketball to be forced to throw a high lob pass that one of our other three players can intercept. In keeping their rule of staying between the ball and the basket, the center will drop down and front the ball-side low block. The chaser will cut down to the high post and will deny any pass that might be made there and also be prepared to jump out and get a deflection on a pass to the wing if the opportunity arises. 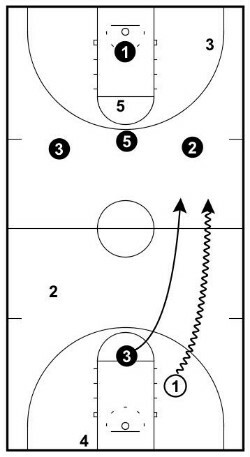 And the weak-side wing player will stay on the weak-side low block. Often when the basketball is in the corner the offensive team will flash a player to the high post. Since this is often out of sight of the chaser, it’s imperative that the weak-side wing is communicating and letting them know if there’s anyone cutting through the key. Similar to the three half-court traps we talked about for the half-court corners, there are two other alternatives to the hard corner trap that you can use. The soft trap is simply being in the passing lane from the corner to the wing and not allowing an easy pass out of the corner. The ball-side wing will be up the line denying the pass while the warrior will be pressuring the ball and forcing the corner player to put the ball on the floor and drive towards the middle, or to throw a long lob pass over the defense. The center will still be fronting the low block, the weak-side wing will be defending the weak-side low block and anticipating a long pass that they can intercept, and the chaser will be guarding the high post. If you decide to not trap the basketball at all in the baseline corner this involves the ball-side wing player taking a step or two back into the line and playing more of a pack line defense. This discourages the corner player from driving the basketball and can be a good tactic to use if there’s a dominant big on the opposition team and you want to keep the ball out of their hands. It allows the easy pass back out to the wing which isn’t necessarily a bad thing if you want the ball to stay on the perimeter. 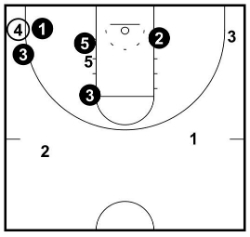 The center will stay fronting the low block, the weak-side wing will stay on the weak-side low block, and the chaser is still covering the high post. Skip passes are a difficult action for the 1-3-1 defense to cover, but it can be done. Let’s break this down into two different skip passes (it doesn’t really matter where the basketball is passed from). 1. Skip passes to the corner. 2. Skip passes to the wing. On all skip passes it will always be the weak-side wing defender closing out on the basketball… but how they close out will depend on where the basketball is skipped to. On skip passes to the corner the weak-side wing player on the low block will sprint out to corner player making sure to not allow the offensive player to drive baseline. As soon as the skip pass is made, it’s crucial that the warrior sprints baseline and gets out to the corner player that the wing is currently defending. When the warrior gets there, they can bump the wing player back up to their normal position. The other option is to immediately trap depending on how your team is running the 1-3-1 zone defense. 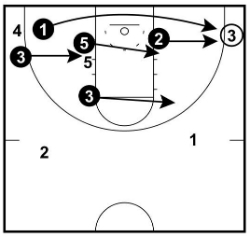 Also, after the skip pass, the chaser must help out immediately by being ready to guard the ball-side wing player if it’s passed there from the corner. The center must fight to get across and establish front position on the ball-side and the weak-side wing will drop to the weak-side low block like normal. Skip passes to the wing are a little harder to defend than skip passes to the corner. When the skip pass is made to the corner we have the chaser able to help if the quick pass is made to the wing, whereas there is no one to help the warrior defend the corner if the skip pass is made to the wing and then the opposition makes a quick pass to the corner. That’s the danger pass and is one of the vulnerable spots of the 1-3-1 zone defense. The wing must banana cut. When the ball is skipped to the weak-side wing, the wing must banana cut out to the wing, taking away the direct pass to the corner, and getting on the hip of the offensive player that’s closest to the sideline. We would rather the opposition drive into the middle of our defense than allow a pass to the corner and an open three-pointer. As soon as the pass is made, the warrior must sprint the baseline and get to the corner as quick as they can. If the pass has been made there, they must do their best to contest the shot without giving up the baseline drive. For the other three defenders, the chaser slides across from the high post, the weak-side wing drops to the weak-side low block, and the center battles to get across and establish positon in front on the ball-side low block. 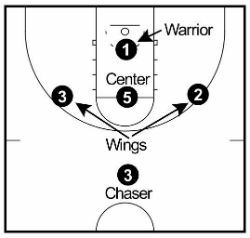 When the basketball is on the wing we’re setting a soft trap with the ball-side wing player and the chaser. 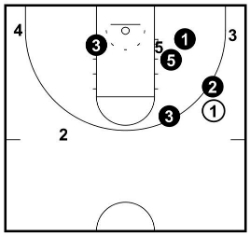 One thing to note is that the 1-3-1 zone defense doesn’t like when the ball is on the wing close to the three-point line. We want to push them out off the three-point line and get the back closer to the half-court line. We can’t allow the offensive player to be comfortable and be able to survey the floor. The wing defender accomplishes this by pressuring the offensive players’ baseline hip and forcing them to retreat dribble towards half court. This also takes away the direct pass to the corner. The chaser should be a couple of feet away preventing the reversal guard-to-guard pass and being in position to potentially deflect any pass made into the high post. The warrior will be between the low post and the corner ready to step out if a pass is made to the corner, the center will be fronting up high on the low block, and the weak-side wing will be on the weak-side low block. It’s important that the weak-side wing is ready to get a hand on any lob passes that are made over our fronting center. Since the 1-3-1 relies on playing directly in passing lanes and forcing lob passes, often we leave gaps that the offensive team may choose to attack through. We stop dribble penetration with the center stepping out with high hands from the high post and pressuring the player driving the basketball. This causes one of the rare times where we will end up with three players defending the basketball making it extremely difficult for the player with the ball to find an open passing angle. When the center steps up to stop dribble penetration, they are no longer responsible for the player they were guarding on the high post or anyone else below them. The task of defending the paint falls to the weak-side wing player and the warrior who must pinch in and prevent any easy passes into the paint. 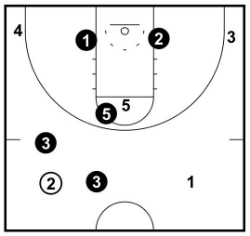 They must also be ready to sprint out to shooters if the ball is passed to the wing. Once the ball is passed out, everyone must recover to their 1-3-1 positions. If the basketball is passed into the high post we must get it out of there as soon as possible. This is a dangerous area against a 1-3-1 zone defense. The player with the basketball has the opportunity to pass everywhere on the floor from this position. This means we will double with the chaser and the center player. We allow the pass back out the top of the key. The warrior and weak-side wing both pinch in and guard the low blocks while the ball-side wing will defend the pass out to their player. If the basketball is skipped to the opposite side of the court, it’s crucial that the weak-side wing player remembers how to guard skip passes by banana cutting out and taking away the direct pass to the corner. 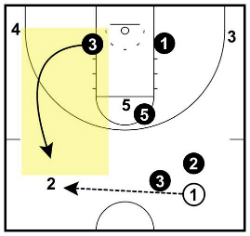 This pass will hurt the 1-3-1 zone defense. If we run the 1-3-1 correctly, we should never have to worry about defending the low post. If the offensive team does get it there, it will usually be a quick shot. 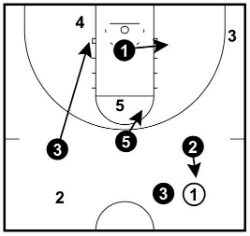 But if we do happen to get into the situation of the center playing defense behind on the low block, the warrior must dig at the basketball until it’s passed out of there. Making sure to not allow a three-point shot from the corner. The chaser drops down to the high post, the ball-side wing is defending the pass out to the wing, and the weak-side wing is defending the weak-side low block. Rebounding should be a massive emphasis when running the 1-3-1 zone defense. As always when running a zone, your team will always be at a disadvantage after a shot since players must find a player to box-out. Let’s refer back to rule #3 – Everyone must crash the boards. And we really mean everyone. 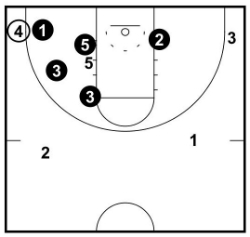 When a shot goes up, you can’t have players leaking out for the fast-break. We need all hands on deck to secure the rebound before we worry about offense. When a shot is taken, the weak-side wing and the chaser are in charge of rebounding on the weak side. The center must battle for rebounding position on the strong side. Usually, it will be one of the other two players contesting the shot so the other must close in to help out on the rebounds as well. The chaser must always rebound the weak-side of the zone. As with many teams that run this defense, don’t be surprised if this player turns out to be your leading rebounder. This defense can work fantastic against a team with one or two great players. The reason why is because the defense can determine how much pressure to put on each individual and can also determine which players on the court are tightly guarded. That’s what makes this defense so versatile. A tactic many coaches have used in the past is to hard trap the opposition’s star player and only soft trap the rest of the team. 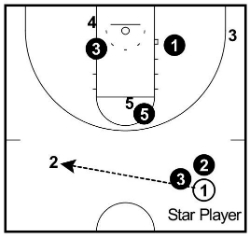 This forces the star player to pass the basketball but also allows the defense to prevent them from getting the ball back while encouraging their teammates to attack. Instead of trapping the weaker players, your team can hedge closer to the star player and discourage the pass back to them. If you use this tactic, your team must be all on the same page and understand what you’re doing. And they must talk to each other! If you’re going to teach the 1-3-1 zone defense to your team, I highly recommend that you teach both variations so that you can change over during the game. 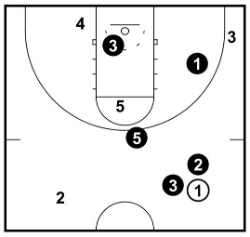 The half-court zone is called ’13’ and is the conservative version of the 1-3-1 zone defense. The biggest difference is that there is no trapping in the half-court corners. 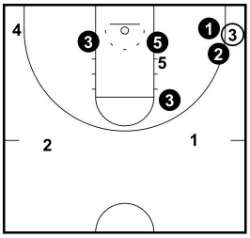 This variation of the 1-3-1 is best suited to a team that isn’t incredibly athletic and would rather slow the game down and keep the opponents on the perimeter. The three-quarter court zone is called ’23’ and is the aggressive version of the 1-3-1 zone defense. When using this variation, your team will trap in all four corners of the half court. This variation is best suited to a long, athletic team that wants to play at a fast pace. There will be many more deflection opportunities, but your team will also allow more open shots and easy baskets. How will your team run the 1-3-1 zone defense? There are four main questions the coach must decide if choosing to implement the 1-3-1 zone defense. 1. Are you going to run the press three-quarter court or just half-court? 2. Will your team trap in both the half-court and baseline corners? 3. What kind of traps are you going to use for each corner? 4. When are you going to use the 1-3-1 zone defense? The 1-3-1 zone defense can be adjusted to suit any basketball team that wants to use it. Your players will become better and better as they get used to the positions and improve at anticipating passes. It’s a fun defense, it has many different variations and adjustments, and I highly recommend you consider using it for your team.